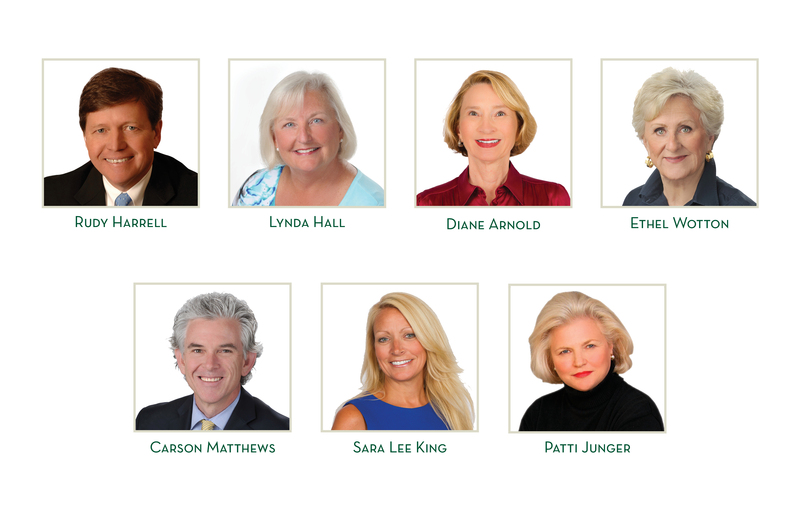 Rudy Harrell, Lynda Hall, Diane Arnold, Ethel Wotton, Carson Matthews, Sara Lee King and Patti Junger have been honored by the Atlanta Realtors Association for consistently being at the top of their field year after year, decade after decade. We asked the Phoenix Award winners to share a few insights about their careers, about helping people people buy and sell homes and how they have kept up such a torrid pace over all these years. If there are similar threads, it is their integrity, their passion and their enthusiasm. Rudy Harrell has been active in residential real estate for more than four decades — with Dorsey Alston since 1988 — and has unparalleled knowledge of the market. That is why he is so popular with Atlanta families. His successful career has allowed him to assist generation after generation of Atlantans find the perfect home. Remarkably his first sale, while technically his smallest, was in many ways his largest. He said he had been in the business about four months and every day his friends with paying jobs would ask if had had made a sale yet. His philosophy in the business is to treat agents not as competitors, but as friends. Lynda Hall has been a successful Realtor in the Atlanta market for more than 25 years. Her enthusiasm, personality and knowledge of the market has served her clients well. She is honest, energetic and helpful as she guides her clients with wisdom and expertise. She is consistently a top sales producer and has a large and loyal client base. Diane Arnold had been working as a nurse at Grady Hospital when she decided to make a change. She had a four-year-old at home, and was working around the clock at the hospital delivering babies. After her family moved into a fixer-upper in Ansley Park, she decided to take a chance and try her hand at real estate. She recalls knocking on a neighbor's door and an elderly woman opening the door the six inches the security chain on the door allowed. They talked for about 10 minutes and Diane handed her her card through the small opening. She has since sold that original house three times, and listed and sold the daughter's house in Vinings and sold a condo to the daughter and her husband. “I never would have thought that it would all have started from a a short conversation through a crack in a chained front door." Ethel Wotton is consistently a top producer, known for guiding her clients through the process of buying or selling a home. She knows market trends and fluctuations — the sort of knowledge that benefits her clients, and that they have appreciated so greatly over her 35 years in the business. Ethel takes the time and care to handle each client’s needs efficiently and creates a “client for life” relationship with each transaction. “I love what I do,” Ethel said. She said her favorite memories are always the friends she has gotten to know. Carson Matthews is a veteran of Atlanta's real estate industry, known for his outgoing demeanor, his professionalism and his marketing prowess. He was introduced to real estate by his mother-in-law Sarah Mock, when he and his wife were relocating to Atlanta. Back in Macon, where he is from, he never moved, and therefore had never considered helping people buy and sell houses as a career. But having studied sociology in college and thriving being around people, he found he had a knack for the business. Known as “the First Lady of Buckhead” for more than 20 years, Patti Junger has clearly defined success in the residential real estate industry in Atlanta. Her consistently tremendous achievements are the result of her thorough understanding of the market, total commitment to customer service and unwavering integrity. Her clients continue to sing her praises as not only an expert in her chosen profession, but as their friend and partner who loves people, loves her work and enjoys nothing more than assisting them in fulfilling their dreams. In addition, with her architect husband of more than 40 years and one of her three grown children in the building business, Patti has developed a keen eye when it comes to all facets of design and construction. Her philosophy is simple, and it works. "Just do the right thing and do everything to the best of your ability and show people you care,” Patti said. Sara Lee King has represented successful home buyers and sellers since 1995. She has a full-service team of experienced marketing, banking, legal, design and construction professionals that all pull together to guarantee flawless transactions. Her steadfast commitment to the Golden Rule translates into superior service. Sara Lee said helping her first client remains a career highlight after all these years. She was volunteering, and met a young lady who had been searching for the perfect home. In particular, she wanted to live in this one townhome community, but nothing was ever available. Sara Lee told her she would be happy to send out a letter on her behalf to every homeowner to see if anyone might be thinking of moving in the near future. Her new friend was blown away by her kindness and that she would be willing to do that. Please join Dorsey Alston in Congratulating Sara Lee, Carson, Patti, Ethel, Rudy, Lynda and Diane!